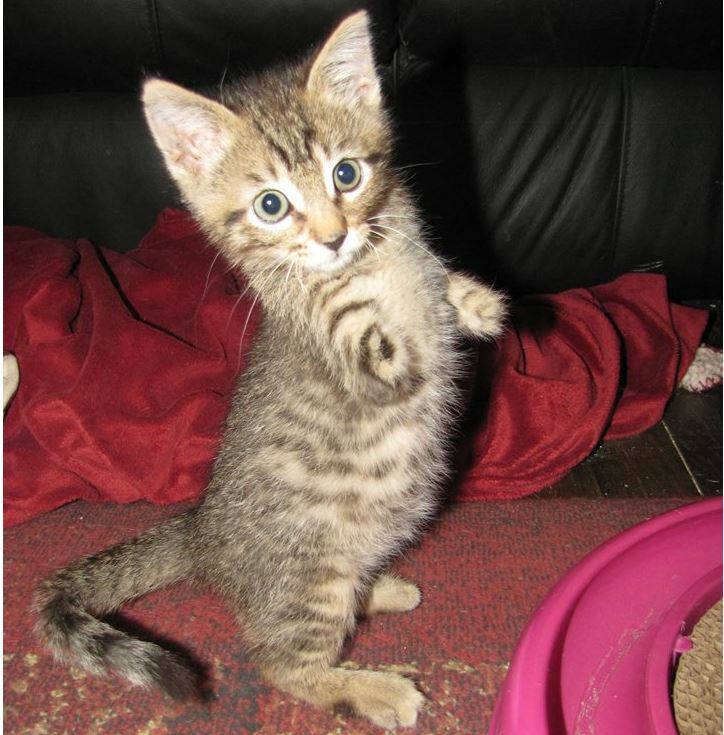 Mercury’s videos went viral when he was a small kitten learning to walk, climb and play with only two legs. A news crew visited Mercury this week to see how he is doing now that he is nearly a year old. Oklahoma’s KFOR Channel 4 News visited Scott Bohn of Edmond, Oklahoma to talk about Mercury, the 10 month old two legged kitten who became widely known several months ago when videos of him meeting daily tasks and playing went viral. Mercury lost his front legs and the tips of the toes on his back legs when, at only 4 days old in September of 2013 he was accidentally injured by a string trimmer being used to clear tall grass. He was taken in by The Community Cat Coalition of Edmond, an all volunteer group operating in Edmond, Oklahoma. Mercury’s caregivers fed him around the clock and cleaned his wounds multiple times a day. As he grew, they helped him with his mobility, and he met each of his challenges. The first video of Mercury showed him moving himself to get to a dropper of milk. Later videos show him learning to stand, to walk, to climb stairs and to play, and also looking for affection and cuddles. As Mercury’s videos went viral, he went from having 5 or 6 thousand fans over 50,000 in less than a week, Scott says. Scott says it has been fun raising Mercury and, while he provides inspiration for thousands, at home he is just another member of the family. What an amazing little guy!! !